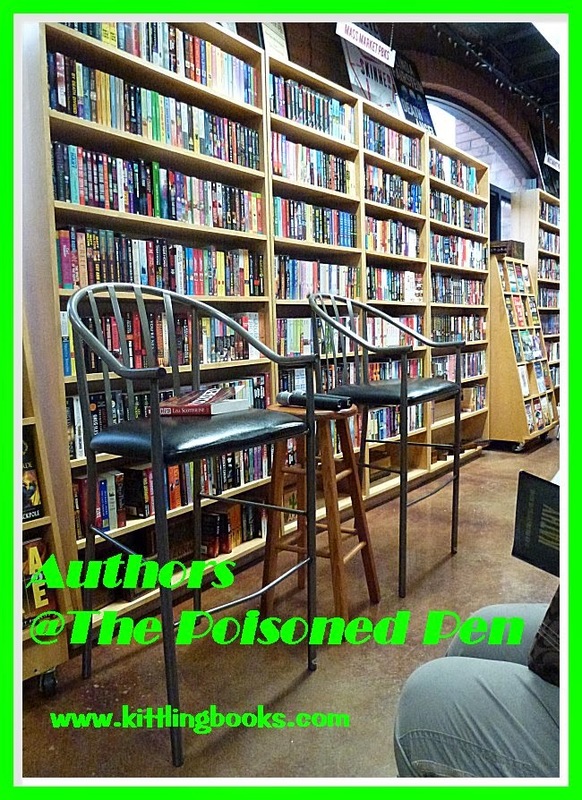 @ The Poisoned Pen with Donis Casey, Eileen Brady, Kate Carlisle and Jenn McKinlay! I walked into The Poisoned Pen Saturday afternoon and stood still for a moment, savoring the air conditioning and letting my eyes adjust from the intense sun outside. It's always hard to gauge how many people will want to battle 110°F (43°C) heat to go to an author event, but I could see that The Poisoned Pen staff had put out quite a few chairs-- and made room for several more just in case. I sat down with my goodies, and in no time flat began chatting with a woman across the aisle who was visiting from Palm Springs. Her husband dropped her off and headed for the mall, and my husband was at work-- and did we ever talk up a storm about books! And while we talked, more and more people came in, and the staff did indeed have to put out those extra chairs. Yippee! I always love it when an author event is so well attended. Double yippee because not only was it a Cupcake Cozy Afternoon, it was Author Afternoon at the Pen-- in addition to the headliners (Donis Casey who writes the splendid Alafair Tucker historical mysteries; Kate Carlisle, author of the Bibliophile series; Eileen Brady, new author of Muzzled, the first of the Kate Turner DVM mysteries; and Jenn McKinlay, the Traditional Mystery Series Queen), there were at least two other authors in the audience: Frederick Ramsay and Betty Webb. There were probably even more, but I wasn't going to try to shift around and gawk like a tourist... especially since Mr. Ramsay was sitting right behind me! 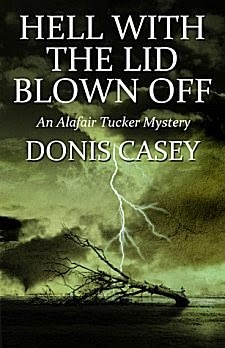 Host and bookstore owner Barbara Peters quickly mentioned Donis Casey's hot-off-the-presses Hell With the Lid Blown Off, saying, "Who knew tornadoes would be in the news right now?" (The book features one.) 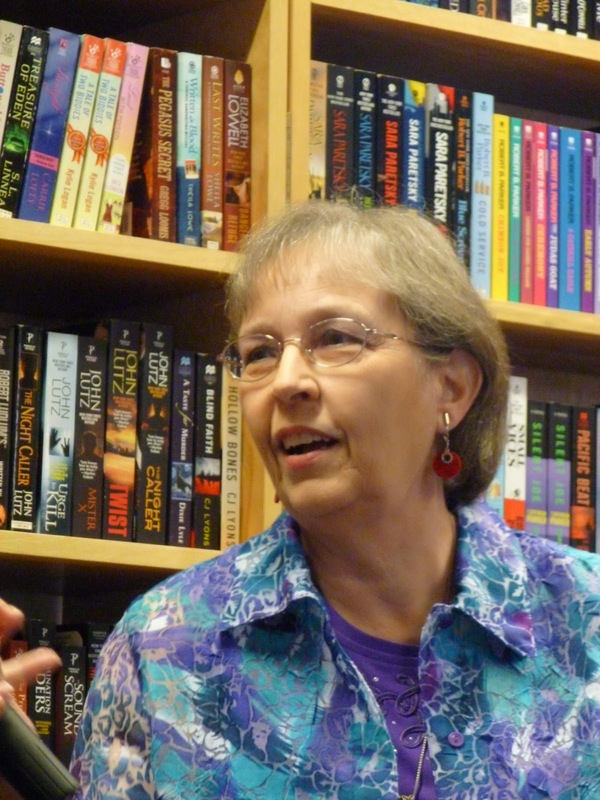 Donis smiled and replied, "Well, the books are set in Oklahoma, so I knew that tornadoes would be topical!" 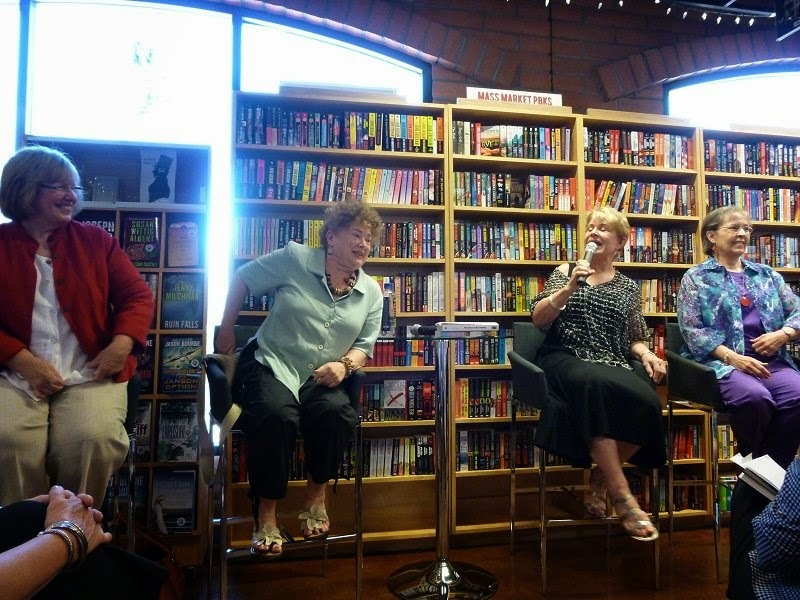 Barbara then went on to explain that she would sit in with the authors to chat with Casey and Brady, two of her Poisoned Pen Press authors, then she'd give up her chair so Jenn McKinlay could assume chat responsibilities, since she and Carlisle are published by the same house. 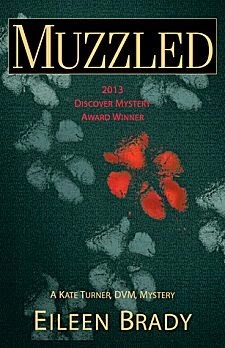 Barbara Peters told us that Eileen Brady was the winner of the Poisoned Pen Press Discover Mystery Contest, and her first book, Muzzled, was just released in May. Then it was Eileen's turn to tell us a bit about herself. She was a veterinarian for over twenty years and now is in charge of management and sales for the practice. Her main character, Dr. Kate Turner, just happens to be a vet who does house calls, so Eileen is able to draw upon all the eccentric clients and animals she treated over the years. In Muzzled, Turner stumbles on a murder during a house call while twenty-six King Charles Spaniels are creating chaos inside. While we were still dazed with our mental pictures of twenty-six dogs running amok, Barbara said that Brady had a very "Agatha Christie-style" element in the book. "Often when reading a Christie novel, you knew the identity of the first person to be killed because they were the nastiest one in the bunch," Peters said. "That's what happens in Muzzled." "I don't know how many of you know this," Peters went on to say, "but James Rollins is a vet, too, and he wrote a blurb for Eileen's book." Eileen got a big smile on her face. "I couldn't write a better one myself!" she laughed. "Unleashed" is set in the Hudson River Valley where Brady had her practice. 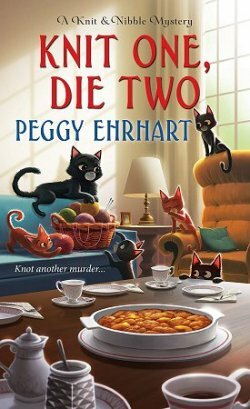 One of the characters in the book is "a woman who dresses like her Chihuahua." (Call me strange, but just that one tidbit made me want to read the book!) Brady does work with a critique group, and often after she's read one of her favorite scenes aloud, her group will tell her, "You need to take that out!" Barbara smiled in agreement. "Authors often fall in love with the worst parts of their books," she said. "I made a list of everyone I've killed." 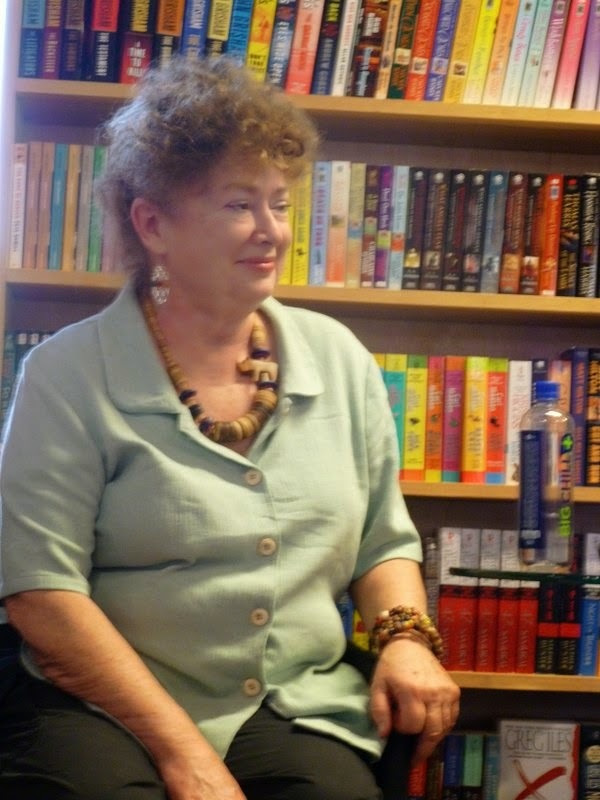 "I fell in love with Donis Casey's titles from the very first book," Barbara Peters stated. (The Old Buzzard Had It Coming) "And the title of the second, Hornswoggled, was a word that I'd heard my parents and grandparents use." Donis smiled and nodded. She does get a lot of comments on the titles of her books. "I usually wait for one of my characters to say something," she said in response to a question about how she comes up with such memorable ones. Growing up in Oklahoma, tornadoes are a fact of life, and you get used to paying attention to the weather and the sky, Donis told us. "When I moved to the Phoenix area, it soon occurred to me that my shoulders had relaxed because I was no longer living in tornado country." She started writing Hell With the Lid Blown Off (a phrase that means something is about as bad as it can get) shortly after Joplin, Missouri, was hit by a twister, and when she told her sister what she was writing about, her sister advised her not to forget about PTSD (Post-Traumatic Stress Disorder), which would definitely be a factor for her characters in the tornado's aftermath. "I always have to figure out how Alafair gets involved in each book," Donis said. "This is a woman with ten children; it's not like she's sitting around looking for something to do! Usually the mystery involves one of her children because Alafair knows no boundaries when something concerns one of her children." "Now Alafair's children are getting married, and grandchildren are coming. Time is passing," Barbara Peters observed. "I'm not sure I want this series to deal with the Dust Bowl though." Donis agreed-- she doesn't want to cover that period of Oklahoma history either. 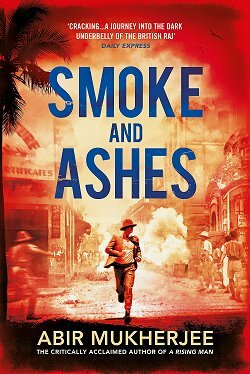 "Come to think of it, Donis's book has the same Agatha Christie tie-in," Peters continued. 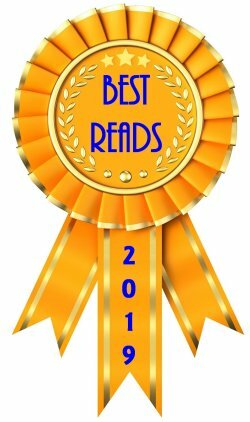 "The worst character in the book-- Jubal Beldon-- is the one who dies. And that's not a spoiler!" "No, it's not," Donis agreed. "The very first sentence of the book tells everyone that he dies." Thinking a bit about Agatha Christie's tendency to kill off thoroughly nasty characters, Donis said, "You know, I made a list of everyone I've killed. [Lots of laughter] Most of those who died weren't really nasty characters-- except for The Old Buzzard Had It Coming-- so I thought it was time to throw in a bad one." At this point in the proceedings, Barbara ushered in one of my favorite people, Jenn McKinlay, author of five different traditional mystery series (a more preferred term than "cozy"). Since she and Kate Carlisle are both published by Berkley-- and since one of Jenn's series involves a cupcake bakery-- Jenn was now officially hosting this "Cupcake Cozy Afternoon." In fact, there were so many people attending that one of the staff had to make an emergency dash for more cupcakes! Jenn introduced Kate Carlisle, author of the Bibliophile mysteries which feature Brooklyn Wainwright, a bookbinder who specializes in restoring rare books. "I'd been writing quite a while before I learned there was something called a 'hook' and that it wasn't the last sentence of the chapter," Carlisle told us with a smile. "Hey, what did I know? I was working for lawyers at the time. But I reached a point when I was finally receiving good rejections, and these rejections would say things like 'Good characters, good story, no hook.' Having a bookbinder as my main character became my hook." "What led you to writing traditional mysteries?" McKinlay asked. 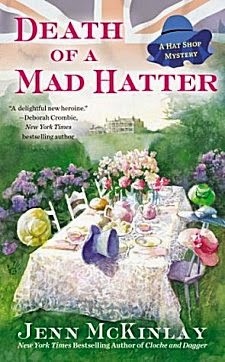 "I like having a main character who's an amateur sleuth," Kate replied. "And the colorful secondary characters. Brooklyn is surrounded by people I love to write about because they're the type of people I'd love to visit. I also like the fact that the murders occur offstage." "Definitely," Jenn replied. "You're not writing 'Murder by X-ACTO Knife' with blood splatter and everything." There was a slight pause while we all agreed that she'd just come up with a good book title. 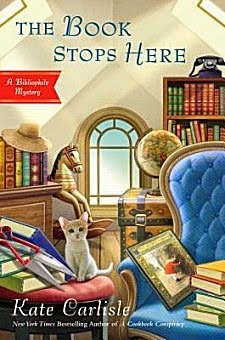 The Book Stops Here is Carlisle's latest Bibliophile mystery. Brooklyn has been asked to be an appraiser on 'This Old Attic'-- a television show very similar to Antiques Roadshow-- and she appraises a very valuable copy of A Secret Garden with ensuing mayhem. Kate then told us about her new series. The first book, A High End Finish, will be released in November and features a building contractor in a seaside northern California town who specializes in Victorian architecture. Members of Kate's own family are in the business and helped supply technical knowledge. I'm definitely going to be on the look-out for that one! The rest of the event was spent in free-flowing questions, answers, quips, and laughter from the authors at the front of the room, and everyone in the audience-- especially the authors sitting in the Peanut Gallery. I loved it! Jenn McKinlay confessed that she's been asked many times if she personally bakes all the goodies in her Cupcake Bakery series. "Noooo... my mom bakes all of them," she admitted, hanging her head a bit and laughing. 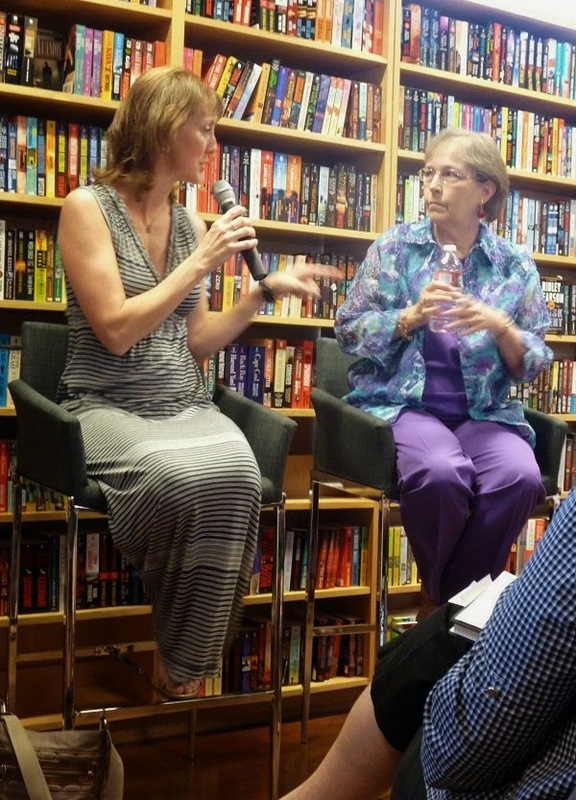 This led to a bit of Mom Talk by two of the other authors. "My mom is a professional mother," Donis Casey said. "I was the oldest and my youngest brother is eighteen years younger. Growing up, I got to see a lot of Mom's tricks for raising kids." Eileen Brady said, "My mother is a professional mother, too, although she did go to college at the same time I did." From there the conversation morphed in a very strange direction: Commas. 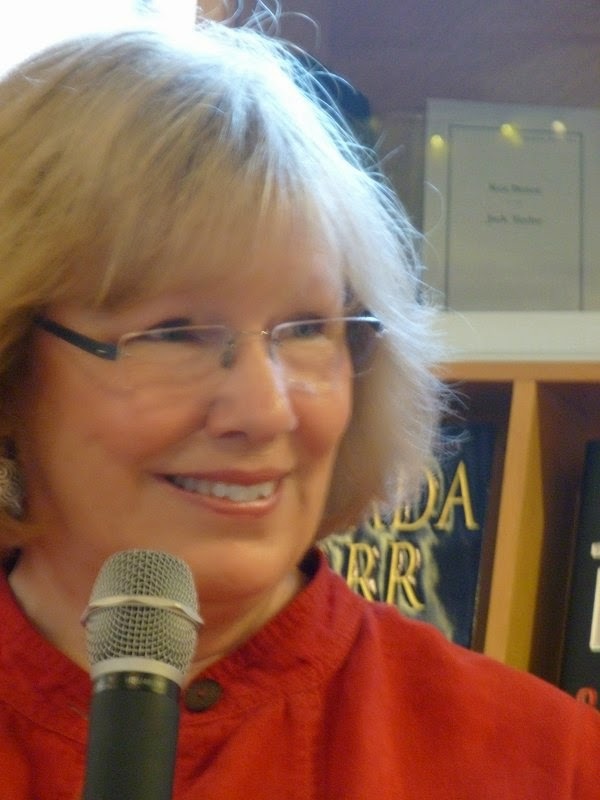 Some of the authors Barbara Peters edits have a difficult time with commas. At this point, we didn't know if they used too many or didn't use enough. "I need to hold a Remedial Comma Class," Barbara announced. Donis Casey joined right in: "I always know when Barbara's just finished editing one of Fred's books because she takes all the commas out of mine!" All the authors in attendance were asked what was the most difficult part of their writing. Donis Casey: Knowing when to stop re-writing. Jenn McKinlay: The saggy middle. Definitely. Betty Webb: I need to be careful because sometimes I write Lena [main character Lena Jones] as too mean, and sometimes I write her as too cute. At least that's what Barbara says! Barbara Peters then mentioned a website called The Vocabula Review for words and grammar. Talk then veered towards travel, with Jenn McKinlay mentioning the trip she took to London for researching her Hat Shop series (and claimed on her taxes) and Betty Webb being pointed out for the research trip to Iceland that she took. Donis Casey looked at both these authors, then out at us. "I've gotta write something that's not set in Oklahoma!" And with laughter and high spirits, we all adjourned for tea and cupcakes! I'd brave the heat any day for afternoons like this one. It was wonderful! 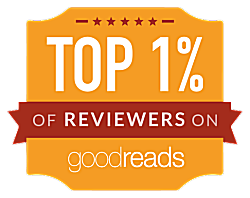 Sounds absolutely delectable, so many authors, so many stories. have a New York branch. Thanks, Cathy, for transporting me back from Greece (with slightly cooler weather at the moment than Scottsdale) for another wonderful time at the Poisoned Pen, filled with so many of my buddies...most notably you adventurously sitting in front of that notorious pigtail puller Fred Ramsay. :) Have a Happy 4th of July.